Welcome to the final week of the second trimester. At 27 weeks pregnant, you're nearly two-thirds of the way toward meeting your baby for the first time. Keep taking great care of yourself and your little one, so these last few weeks will pass quickly and uneventfully. By week 27, your baby is about 14.5 inches long and almost two pounds. He may have tripled in size since the 12th week of pregnancy. The Mayo Clinic reports that your baby's lungs are continuing to mature this week. His nervous system is also continuing to develop. You may also notice that your baby has hiccups from time to time, resulting in a rhythmic sudden jerking sensation inside your belly. Don't worry about the hiccups. This is perfectly normal and may be related to you little one's newly maturing lungs. According to WebMD, your uterus is continuing to expand this week. This can result in increased pressure on your bladder, mild pain in your abdominal muscles, and pressure in your ribs. Keep applying a moisturizer to avoid those stretch marks. Additionally, you may find that your increased weight and changing center of gravity are affecting your balance. Clumsiness is perfectly normal during this stage of pregnancy, so be extra careful going through your regular daily activities. Always hold railings when going up and down stairs, and try not to rush. If you do fall, be sure to contact your doctor right away to ensure everything is fine with both you and the baby. The American Pregnancy Association reports that you should be feeling your little one move on a regular basis by this point in the pregnancy. Keeping a log of your baby's movements can help you stay informed about patterns and watch for any disturbances. Generally, your baby will move about 10 times per hour. This includes kicks, punches, rolls, flutters, and swishes. Of course, your baby may move less if he is sleeping. Many babies are most active during the evening hours, since the motion of the expectant mother walking lulls them to sleep. 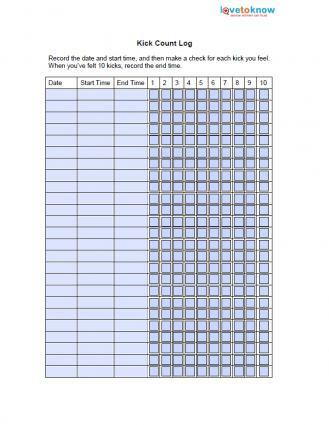 Determine when your baby seems most active, and do your kick count at that time. Lie down or sit in a comfortable position. Lying on your left side is especially good, since it gives your baby plenty of blood flow. Note the time on your chart. Record each kick you feel until you reach 10 kicks. Note the time when you reached 10 kicks. If you're concerned that your baby isn't moving, sit down for a brief snack such as a glass of orange juice or milk. Then, lie down for about an hour. This combination of inactivity and increased blood sugar levels should motivate your baby to start moving! If you notice a significant change in your baby's movement habits or if more than 24 hours have passed since you've last felt your baby move, contact your healthcare provider. He will be able to perform further tests to determine if there is a problem. If you need help downloading the printables, check out these helpful tips. The second trimester is almost over. Next week, you'll enter the third trimester, also known as the "home stretch."